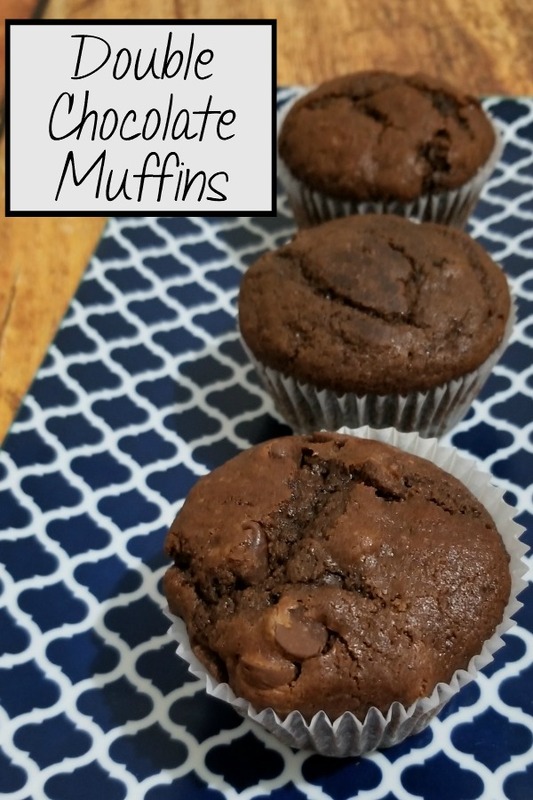 They’re not as rich, nor are they as sweet, as a cupcake, but you can definitely plan on these double chocolate muffins as a dessert option. Links may be commissioned. Thanks for supporting our site when you purchase through them! We really like to use a scoop to fill our muffin pans. 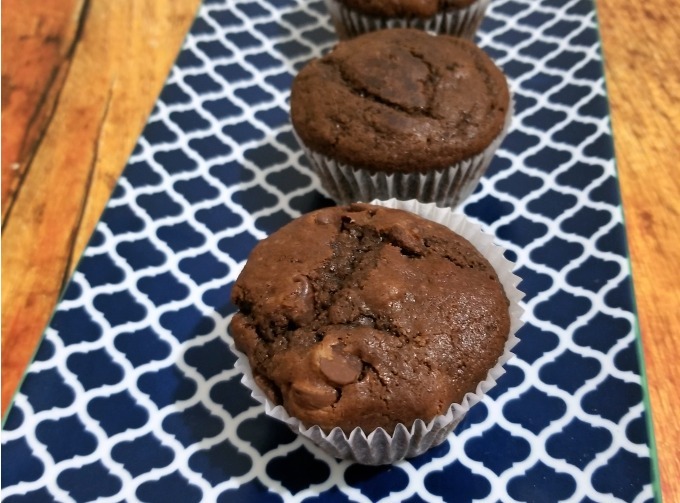 Using a scoop makes it easier to control the mess, and make uniform sized muffins. We also love the parchment muffin liners. There’s no sticking, and these liners almost fall away from your muffins or cupcakes. And, of course, a quality muffin pan is something everyone needs! Preheat oven to 400 degrees. Line 18 standard muffin cups with papers. If you don’t use paper cupcake liners, spray with non-stick spray or grease the muffins cups. Place flour, cocoa powder, and brown sugar in a large mixing bowl. Stir with a whisk or wooden spoon until all the dry ingredients are combined and no lumps of sugar remain. In a smaller bowl, break the eggs, and beat so they will combine with other liquid ingredients. Add yogurt, milk, oil and vanilla; beat or whisk to mix well. Pour liquid ingredients into dry mixture. Using a spatula or wooden spoon, gently mix by turning dry ingredients into the wet mixture. Gently fold by scraping from the bottom of the bowl and turning to incorporate the dry and wet ingredients. Do this about 10-15 times, just until combined, and no streaks of the flour mixture remain. Stir in in chocolate chips. Using a large spoon or scoop, fill muffin cups about ¾ full These will round off, but don’t rise much. Once all your cups are filled, place in oven. Bake for 15 to 20 minutes. They should be springy to the touch, and a toothpick should come out almost clean. A few clingy crumbs are okay. 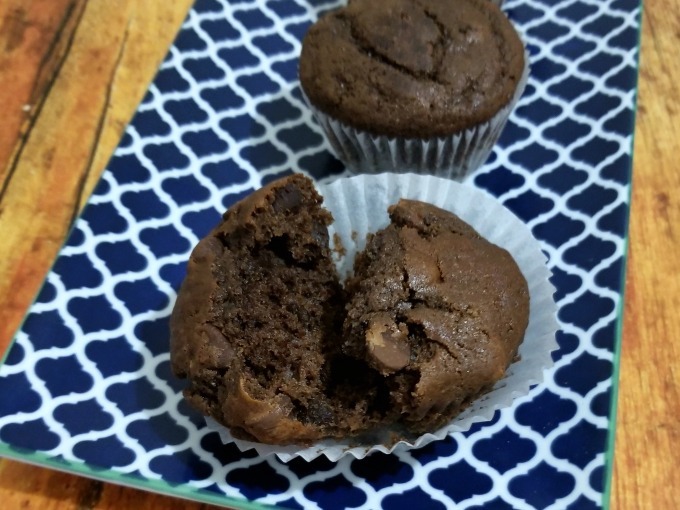 These double chocolate muffins are so super simple to make, and no one will believe you made them from scratch. You can also use sour cream or buttermilk in place of the yogurt. Personally, I like the little tang that Greek yogurt gives these muffins. You can adjust the quantity of chocolate chips, too. More is better, but less are still really good. Do you love muffins? Don’t forget to pin these for later!